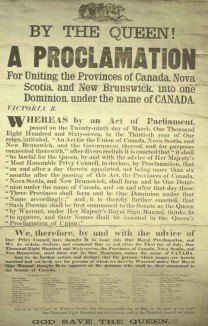 The original proclamation of Canada's formation on July 1, 1867. This year marks the 150th anniversary of Canada’s formation as a self-governing country rather than a collection of provinces each with its own governor. The grand date of July 1, 1867 is something we remember every year with fireworks, face-painting and red-and-white cake. Most people cheer Victoria Day as the first long weekend of summer, but July 1 is when summer really kicks off. Of course, there was much more to Canada before Canada came into existence. Vancouver was built in the absence of any treaty arrangements with the locals, and on B.C.’s entry into confederation on July 20, 1871, no one gave the lack of treaties much thought. Westside Vancouver real estate chugged along, driven by the Canadian Pacific Railway. Kitsilano takes its name from August Jack Khatsahlano, a Squamish chief born the year the new country came into existence. The names of the Spanish and English explorers and colonizers dominate the street names of Dunbar and Point Grey, however. Here’s a quick overview of where Westside neighbourhoods have come from over the past 150-plus years, memories we can take forward into the future. Squamish Chief August Jack Khatsahlano (1867-1971) was a resident of Sen̓áḵw, an indigenous settlement on Kitsilano Point. Khatsahlano taught us much about the Squamish people’s history and traditions. His importance to Vancouver lives on in Kitsilano’s name. The present-day community of Kitsilano owes its existence to the forcible displacement of the Squamish from the area at the end of the 19th century. Originally a rustic retreat for residents of downtown, the neighbourhood developed under the Canadian Pacific Railway. Homes replaced the native forest and lumber mills. Waves of immigrants in turn replaced the Squamish, first the English then the Japanese, Greeks and emigrés from Hong Kong and other parts of Asia. The Musqueam people first settled the area known as Dunbar 4,000 years ago, but were present from time immemorial. Stories trace the origins of the Musqueam to X’muzk’I’um, or Camosun bog, on the western edge of the neighbourhood. The current wave of settlement began in in 1863, when Europeans began farming the fertile riverfront land on the neighbourhood’s south side. Today, the Southlands is Vancouver’s last remaining farmland. As with many Vancouver neighbourhoods, the Canadian Pacific Railway led development. With a predominantly older housing stock, Dunbar is a living witness to Vancouver as it was in the mid-20th century. Point Grey as a landform includes both the University neighbourhood and the old municipality of Point Grey. To the Musqueam people, it was Ee’yullmough. Point Grey was its own municipality from 1908 to 1929, when it amalgamated with the city of Vancouver. The Spanish were long gone by Confederation but they live on in street names such as Blanca and the beaches Locarno and Spanish Banks. The university was founded in 1908, part of a desire for Canada’s westernmost province to have its own seat of higher learning. Prior to its creation, McGill University operated a college for local students. Today, UBC has won international respect as the equal of any eastern college. Tower Beach, just off the north side of campus, is home to watchtowers and other remnants of the fortifications that guarded the entrance to Burrard Inlet during the Second World War.